When Pope Francis visits Philadelphia this September following the World Meeting of Families, in addition to the huge numbers of the faithful in town hoping to see and hear the Holy Father, it’s a certainty there will be thousands of journalists all trying to get a unique quote, if not from the lips of Francis himself but from people who came to see and hear him. Since there will be far too many for the Communications staffs of the archdiocese and the World Meeting of Families to serve, an invitation went out for volunteers who are knowledgeable in the faith to attend weekend training sessions so they will be able to articulate the faith in the public square as needed. In a letter last December, Archbishop Charles Chaput said more than 5,000 reporters are expected to be present in Philadelphia for the families’ congress Sept. 22-25 and the papal visit Sept. 25-27. “We’re going to need well-informed priests, religious and lay people from across the archdiocese who represent the broad spectrum of our diverse Catholic family to help us speak to the media about Church teaching on a variety of matters,” he said. He invited local Catholics to attend training sessions offered by Catholic Voices USA in conjunction with the Communications Office of the Archdiocese of Philadelphia and communications personnel with the World Meeting of Families. Founded in 2012, Catholic Voices USA is one of a dozen similar groups around the world patterned after Catholic Voices UK, which was founded in 2010. Catholic Voices has done similar training in a number of dioceses. The purpose is not to tell people what they should say but rather how they should express it, and the techniques are effective no matter what the topic. By coincidence when Catholic Voices UK was founded, the first issue they dealt with was a visit by Pope Benedict XVI to England. 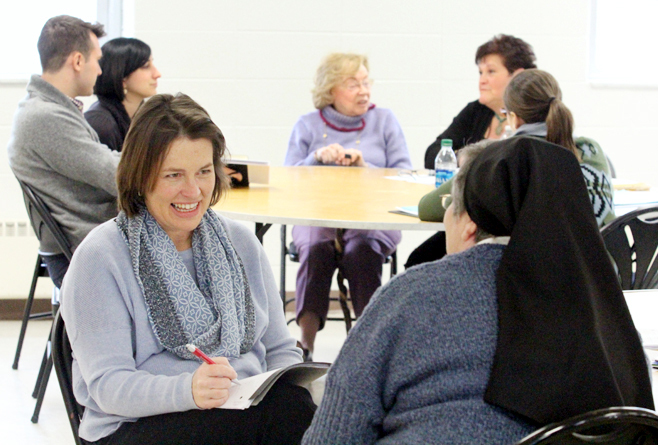 The initial training sessions were held at St. Charles Borromeo Seminary in January and most recently on Friday evening, Feb. 20 and Saturday, Feb. 21. Fifteen people had signed up to come to last week’s sessions, according to Lizanne Magarity-Pando, director of communications and marketing for the World Meeting of Families. Considering the terrible weather conditions on Saturday, it would not have been surprising if there were a number of cancellations. The opposite was true. Eighteen people showed up, including some who had not pre-registered. It augers well for the program that will have at least three more training sessions in coming months, one more at St. Charles Seminary and two at the Archdiocesan Pastoral Center in center city Philadelphia. Leading the training sessions of Catholic Voices was Kathryn Jean Lopez, one of the founders of CV in the United States. One of the first training programs CV USA conducted was at the time of the U.S. bishops’ “Fortnight for Freedom” campaign for religious liberty, Lopez said. Other sessions have been done in New York, Boston, Washington, D.C., San Diego and Lincoln, Nebraska. Both Magarity-Pando and Lopez were more than pleased with the initial weekend training session, and look forward to the coming sessions. Father Carl Janicki, director of campus ministry at Cabrini College in Radnor, was a member of the first group trained and was impressed by the professionalism and the positive support they were given as they went through the training. Fran O’Donnell, a member of St. Genevieve Parish in Flourtown, sells real estate for a living but was at the weekend meetings to learn how to sell the Good News of the Lord.